A leaked US intelligence report has cast fresh doubt on the coalition claims that Iraq had banned weapons which served as justification for going to war. The secret September 2002 Pentagon intelligence report concluded that there was "no reliable information" that Iraq had biological or chemical weapons. It is believed the report was widely circulated in the Bush administration at a time when senior officials were putting the case for military action. The latest twist in the weapons row came as United Nations nuclear experts arrived in Iraq to investigate post-war looting of material from the country's main nuclear facility. The BBC's Pentagon correspondent Nick Childs says the 80-page report from the Defence Intelligence Agency (DIA) will only fuel the controversy over alleged Iraqi weapons of mass destruction (WMD). It undermines Defence Secretary Donald Rumsfeld's claim at the time that Iraq had amassed large stockpiles of nerve agent and mustard gas. 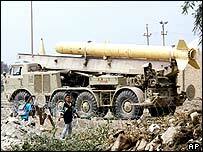 US forces have not yet found any WMD in Iraq. Two suspect mobile laboratories have been located but have not provided any proof of banned weapons programmes. The DIA's director, Vice Admiral Lowell Jacoby, said the leaked extracts from the intelligence report should not be taken to mean his agency doubted that Iraq had a WMD programme. WERE WE MISLED OVER WMD? You don't think that Saddam was knitting for the last few years after he kicked out the inspectors? Have some patience. But he said it did show that the DIA "could not specifically pin down individual facilities operating as part of the weapons of mass destruction programme, specifically the chemical warfare portion". He was speaking at a joint news conference with Pentagon intelligence chief Stephen Cambone and Republican Senator John Warner, who is planning hearings on the pre-war WMD intelligence. Senator Warner urged Americans to trust the administration's claims. Pentagon officials stress that there was no US or international presence on the ground in Iraq in September 2002 and that therefore there could be no definitive evidence. A summary of the DIA report, quoted by CNN, said Iraq was "steadily establishing a dual-use industrial chemical infrastructure that provides some of the building blocks necessary for production of chemical agents". And it said Iraq was "assessed to possess biological agent stockpiles that may be weaponised" - though the size and nature of those stockpiles was unknown. It also noted various factors limiting Iraq's ability to produce chemical and biological weapons. US administration officials insist that their claims about Iraqi WMD will be proved to be accurate. The CIA has launched an investigation to see if intelligence reports were distorted to exaggerate the threat posed by Saddam Hussein. The UN chief weapons inspector, Hans Blix, has criticised the quality of intelligence given to him by the US and Britain about Iraq's alleged WMD. 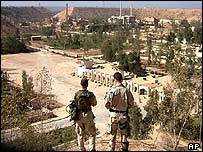 Mr Blix told the BBC that his teams followed up US and British leads at suspected sites across Iraq, but found nothing when they got there. The team of seven experts from the International Atomic Energy Agency (IAEA) will spend two weeks at the Tuwaitha complex, 50 kilometres (30 miles) south of Baghdad. They will try to determine what is missing, deal with what is left and make it safe. The UN experts at Tuwaitha are being blocked from investigating the reports of contamination and sickness. The US argues that as the occupying power it is responsible for the health of the Iraqi people. The Pentagon limited the number of inspectors to seven. Local people have been using barrels that held highly radioactive material to store food or wash clothes and some have complained of health problems, such as nose bleeds and vomiting. They say looters were not after the uranium itself. They tipped it onto the ground so they could take away the containers to store food and water, the BBC's Caroline Hawley reports from Baghdad. Workers living on the site, worried about being contaminated themselves, buried the spilled uranium in cement and appealed for international help. Before the war, the site held two tons of low-grade enriched uranium and several tons of natural uranium. A nearby storage facility held other radiological sources. US defence officials insist that US troops accompany the UN inspectors at the site, and that the visit sets no precedent for a future IAEA role in Iraq. The Americans will deal with the search for WMD themselves - a US-backed team of 1,400 inspectors is due in Iraq in the coming days.